First off, thanks for all of your notes and comments following yesterday's little introduction. I can't wait to get to know all of you a little better! 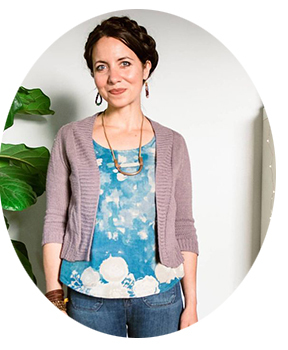 Also, thanks for your encouragement and enthusiasm regarding my new pattern collection. It's hard putting yourself out there, not knowing what kind of response one will receive. Here's a sneak peek of one of the three patterns I will be starting to sell within the next month. I'm so happy with how it turned out, and I hope you mamas out there will love it! 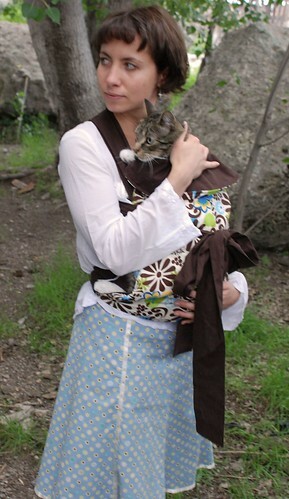 It's an Asian baby carrier, also known as a Mei Tai. 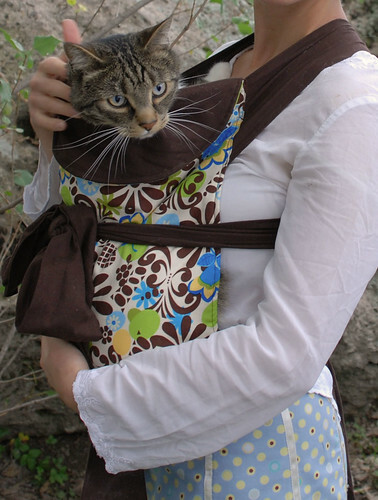 But first things first, I really need to give a shout out to my cat, Timoun, who's a snuggly type and doesn't mind being carried around baby-style. FYI, he's about the size of a six-month-old infant. With a smaller head, of course ... and a hairy body. This is a really comfortable carrier. The shoulder straps are wide, and the weight is distributed comfortably across your back. There's no hardware or uncomfortable metal rings that pinch. Just pure, almost seamless, flannel-lined cotton. Yum. Also, the flip-up head support doubles as a nursing shield. 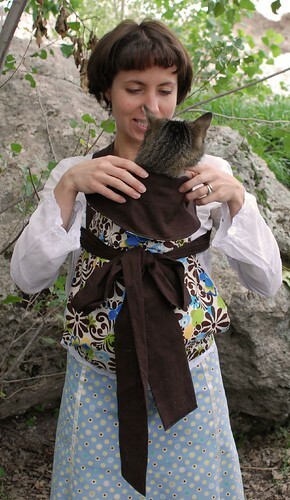 My pattern includes an internal x harness for safety and comfort. Most mei tais have straps that attach only to the edges of the main panel, which makes me a little nervous - this pattern is unique in its super safe construction. 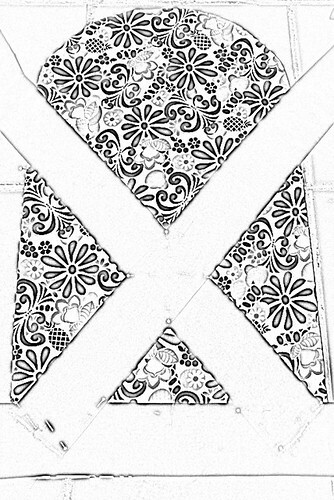 Here's a photo sketch (made at www.dumpr.net) of the x harness before sewing and inserting. For more photos of mei tai's, see the following links. 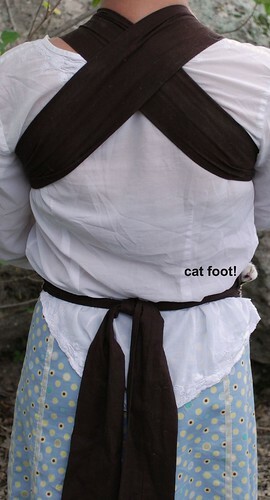 I've also included a link on "how to wear a mei tai." It can be worn in the front, side, or back. But Timoun's not that complacent! Check back tomorrow for a sneak peek at the second pattern, which is a design that the entire family will love. Here's a hint - it promotes literacy. Any guesses?